Senate President Stanley Rosenberg, under mounting pressure from inside and outside of the State House, intends to step down as the leader of the Senate for the unknown duration of an investigation into allegations of sexual assault against his husband Bryon Hefner, but it remains to be seen whether the full Senate will elect a new permanent president or agree to allow him to eventually return to his perch. Rosenberg, in a letter that was shared with members of his leadership team at a morning meeting Monday, said he intended to take a "leave of absence as your president, effective immediately" for as long as the investigation lasts. "I believe this is in the best interests of the Senate. I want to ensure that the investigation is fully independent and credible, and that anyone who wishes to come forward will feel confident that there will be no retaliation," Rosenberg wrote in the letter. Rosenberg asked in the letter that the Senate elect an "Acting President" in his absence. Democrats plan to discuss how to proceed in a closed-door caucus ahead of a planned formal session in the afternoon. Tensions ran high as senators arrived on Beacon Hill Monday morning prepared to discuss how to proceed with an investigation into allegations of sexual assault against Hefner with the political career of Hefner's husband, Amherst Democrat Rosenberg, hanging in the balance. Senators are paying attention to allegations anonymously made to the Boston Globe by four alleged male victims that Hefner boasted about influence he wielded over Senate policy decisions. Rosenberg's grip on power in the Senate appeared to be tenuous after the weekend gave senators time to reflect on the allegations against Hefner and how to move forward without causing more damage to the body as a whole. Several Democrats were reportedly making calls to their colleagues to either round up support to succeed Rosenberg or to urge their colleagues not to commit to a successor until it was decided whether Rosenberg would remain on the job. "The caucus will decide the direction," Ways and Means Chairwoman Karen Spilka told reporters on her way into a meeting with Democratic leadership ahead of a planned caucus of the full party membership. "I've been calling people to talk about the issues, but..." she said, cutting herself short. While many senators were mum on their personal beliefs, pressure was also mounting from the outside on Rosenberg to relinquish his leadership post during an investigation into his husband's alleged harassment. While some senators left the door open to recommending Rosenberg step aside, Sen. Michael Barrett made a defense of the president Monday morning and a case for him to remain on the job. Barrett, a Lexington Democrat, called the allegations against Hefner "deeply unsettling," but defended Rosenberg who has said he did not know of his husband's behavior until the Globe report. The statement came before Rosenberg indicated he was prepared to temporarily give up the gavel. "As terrible as all this is, both for the apparent targets of inappropriate behavior and for the Senate itself, none of us is legally or morally responsible for the actions of our spouse unless we're aware of it and don't try to stop it," Barrett said in a statement Monday morning. He continued, "An independent investigator must inquire into these very questions. Until then, the presumably wronged spouse is innocent until proven otherwise and should be able to continue in his job, one the current president happens to do quite well." Senators were meeting midday Monday to discuss how to move forward with an independent investigation into allegations made to the Boston Globe by four men who say they were sexually assaulted and harassed by Hefner. Though Rosenberg on Friday recused himself from the investigation, Sen. Barbara L'Italien said Friday and again over the weekend that his continued presence in the president's office could stifle an investigation. The Boston Globe and the Daily Hampshire Gazette, Rosenberg's hometown newspaper, have called on him to step aside until the probe is complete. "My heart goes out to the victims. Clearly, nobody, absolutely nobody, should have to put up with any sort of sexual assault or sexual harassment and it's clear what has become crystal clear in this process is that we all in the State House have a long way to go to make that a reality," Spilka said. "I believe that we need to take a good hard look at all of our processes and make it so that the victims are able to feel comfortable to report incidences when they arise." Spilka, according to comments made on TV by a political strategist and sources familiar with internal discussions in the Senate, is said to have been asking colleagues in private phone calls to keep their options open if Rosenberg can no longer continue in his role. She did not deny those accounts when asked Monday. Sens. Linda Dorcena Forry, Sal DiDomenico and Eileen Donoghue are also said to be testing their support among colleagues to become the next Senate president, and some believed Forry may be close to rounding up the required votes to succeed Rosenberg. If Rosenberg does, in fact, believe he can return to the presidency, it's likely he would prefer to see someone in his inner circle like Majority Leader Harriette Chandler, and not Forry, take over in the interim. Before Rosenberg told his colleagues he would step aside, reporters asked Spilka whether there could be a new Senate president before the end of the day. 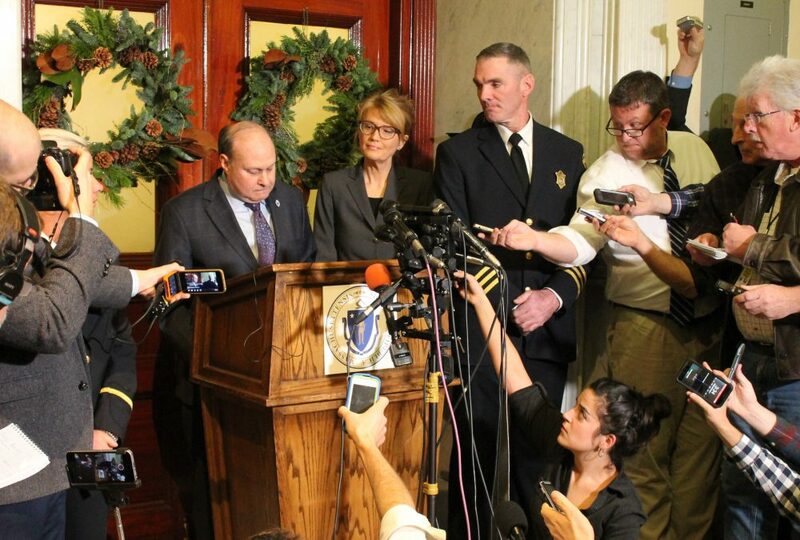 Spilka said, "I don't believe that right now we should be discussing that. I believe that our focus should be on ensuring that the Senate continues to move forward, ensuring that we maintain the strength and integrity of the Senate as a body." However, in the same short interview she also said, "Our focus as members should be the integrity of the body and we should talk about that as colleagues and members of the Senate. I don't know what will happen. The allegations and the reports are deeply, deeply disturbing." The Senate was supposed to be in recess from formal sessions for the year, but senators are expected to take special steps to convene in a formal session on Monday to consider how best to initiate an investigation of the allegations against Hefner, including claims that he allegedly made to those he harassed that he had influence over Senate business. Rosenberg on Friday denied that his husband had any role in Senate decision making. According to a Rosenberg aide, neither Rosenberg nor any of his staff will have a role in the deliberations on Monday, with Chandler's office taking the lead role, along with Minority Leader Bruce Tarr. Chandler, of Worcester, declined to comment as she arrived at the State House around 9:20 a.m. Monday. "There will be plenty of time for that later today," she said. A press conference is planned for 12:30 p.m. with Tarr after Democrats and Republicans take part in a rare private joint caucus. With tensions running high, other senators were also reluctant to speak publicly Monday morning ahead of their deliberations with colleagues. "No comment," Senate President Pro Tem Marc Pacheco said before he was even asked a question. Sen. Michael Rodrigues, the chair of the Senate Ethics Committee who was traveling in Portugal last week when the news broke, also declined to comment. "You will have my comments when the time is right," Rodrigues said. He would not say whether the Ethics Committee would play a role in the investigation. Sen. Viriato deMacedo, a Plymouth Republican, called the whole situation a "challenging" time for the Senate that was thrust on the members unexpectedly. "I've worked with Stan. We have a great professional relationship. These allegations aren't about Stan right now, they're about somebody else, and I've got to understand before we cast judgment. It's a lot to absorb, I think you can understand that," deMacedo said.